Canadian officials welcomed the decision by Armenia’s Prime Minister Serzh Sargsyan to step down on Monday following 11 days of mass and largely peaceful protests against his continued rule in the former Soviet republic. Sargsyan, who ruled Armenia for 10 years, resigned Monday as prime minister after tens of thousands of people flooded the streets in the capital of Yerevan and other cities and towns to protest his political maneuvering to cling to power in the South Caucasus republic. Canada respects Sargsyan’s to step down as prime minister, following peaceful negotiations with opposition leaders, Austen added. Pressure on the 63-year-old to quit had increased sharply on Monday when unarmed soldiers in the capital Yerevan joined the anti-government protests, which first erupted on April 13 and grew steadily until Monday. More than 100,000 people demonstrated on Sunday their anger with Sargsyan, who had already served two terms as the country’s president and was elected last week by the ruling Republican Party to be the country’s prime minister under the new constitution, despite having repeatedly promised not to do that. Protests were also held all across the Armenian Diaspora worldwide, including in Montreal, Toronto and Vancouver, where most of Canada’s 63,000-strong Armenian community is concentrated. 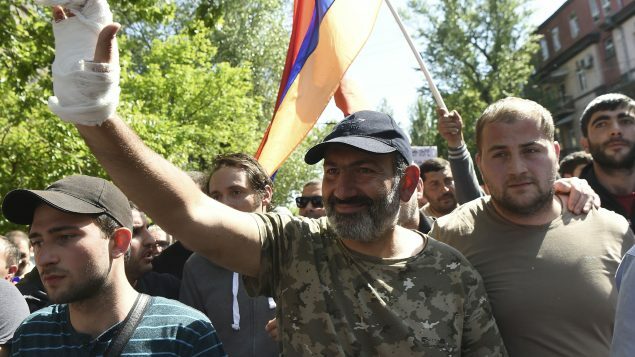 Sargsyan’s gamble that the arrest of protest leader and opposition MP Nikol Pashinyan following a dramatic meeting between the two men would break the will of the protesters backfired. Even more people joined the protest on Sunday evening and the government was forced to release Pashinyan, who had been arrested alongside hundreds of demonstrators on Sunday. “Nikol Pashinian was right. I was wrong,” Sargsyan said in his mea culpa statement. “The movement on the streets is against my rule. I’m complying with their demands. 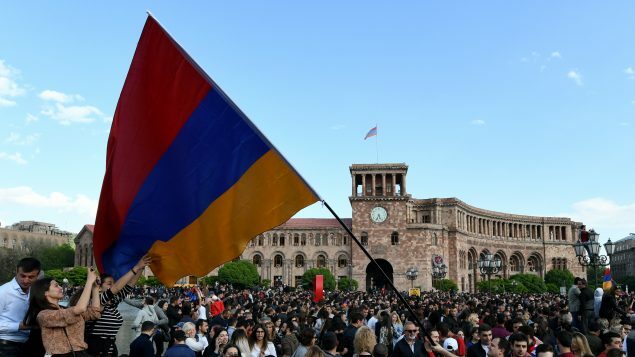 The stunning development touched off jubilation in Yerevan, with car horns blaring and people dancing in the streets, hugging and waving the tricolor Armenian flag. 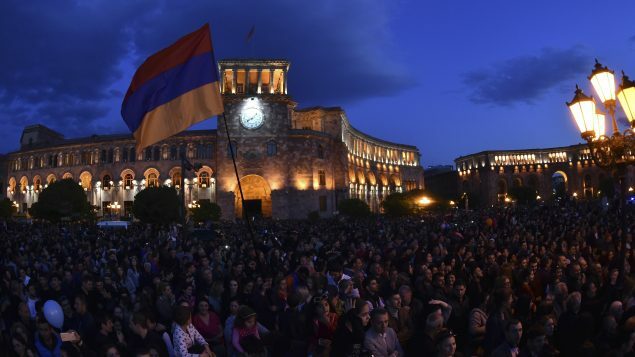 Pashinyan told an evening rally of tens of thousands of people at Republic Square in Yerevan that the opposition will suspend its protest activities on Tuesday, when Armenians around the world mark the 103rd anniversary of the 1915 Armenian Genocide in Ottoman Turkey. 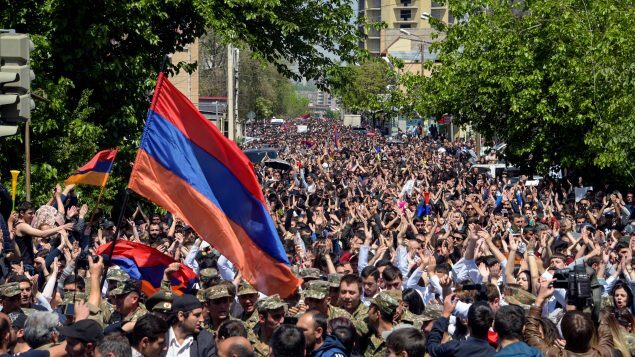 However, opposition activists want to meet with acting Prime Minister Karen Karapetyan on Wednesday to discuss a “peaceful transfer of power,” Pashinyan told the jubilant crowd. The opposition will push for an early parliamentary election to prevent Sargsyan from running Armenia from behind the scenes, Pashinian said. President Armen Sarkissian has accepted the prime minister’s and the government’s resignation. Armenia’s political parties in parliament now have seven days to put forward the name of a new prime minister. Sargsyan’s allies remain in key positions in the government and it remains unclear whether his resignation will herald any real change. Successful democratic elections, and active opposition parties are to be hoped for.